Another recipe from Macy Jacobsen. I don’t like coffee, so I’ve never even tried this recipe, but I’ve heard enough people go on and on about how great it is that I had to put it up. This drink doesn’t contain any alcohol, so feel free to serve it anywhere you see fit. Combine coffee granules & boiling water, stirring until coffee disolves. Add sugar, stirring until sugar disolves. Cover and chill. Combine coffee mixture & milk in large punch bowl. 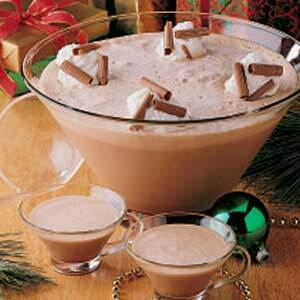 Gently Stir in ice creams & spoon whipped cream on top.